We stopped at the grocery store on the way home from the kids basketball game to pick up fix-in's to make BLT's for lunch and L.J. spotted $3 a pound clams on sale. 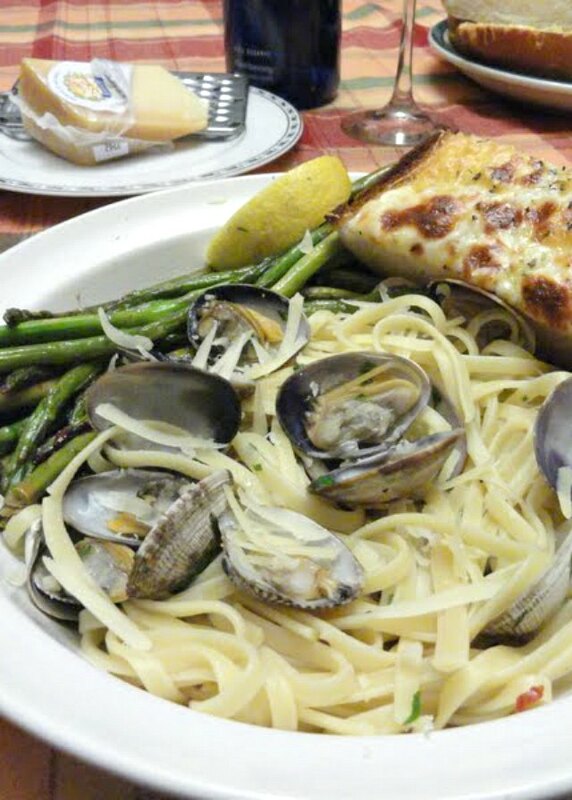 He begged and pleaded for us to make Clams with Linguine in a White Wine Butter Sauce for dinner. Who could blame him? Not me. We enjoyed this as an early lunch yesterday after church. I forgot just how much I love the clam spiked noodles with the creamy white wine butter sauce. Slurp.. It's quick enough for a nice lunch or easy weeknight dinner, but elegant enough for company. The kids were circling around Colt yesterday afternoon like little vultures once lunch was done. I think we pushed them past the point of patiences. Colt was trying to plate the pasta plus get a picture, so I finally stepped in and served the kids in an effort to avoid chaos from breaking out in our kitchen. Hungry kids = Cranky kids. 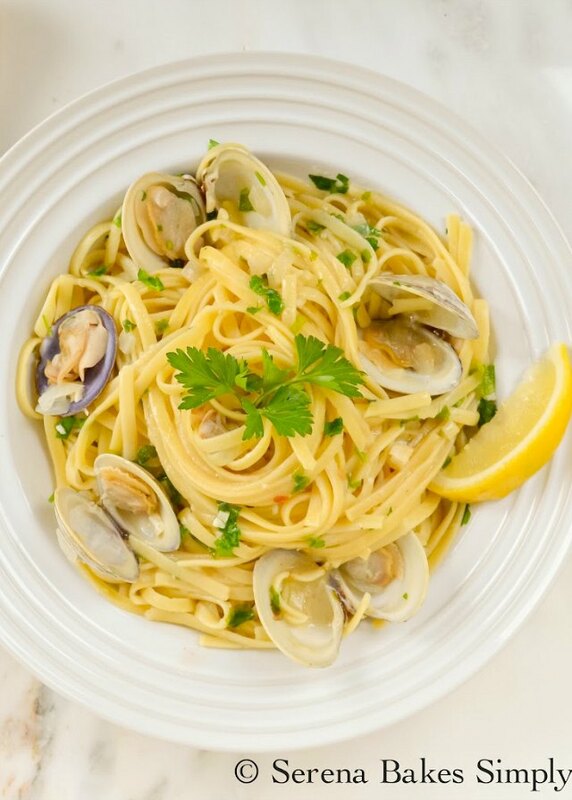 Clams with Linguine Sauce is a a favorite in our house anytime. Clams were on special this week and local, so it was a must on the dinner menu. The kids absolutely love clams! The last time we had clams was when we where down at the Oregon coast and decided to have a clam bake. Let me tell you it didn't go over very well. First off it was extremely windy and then there was the fact we bought a cheap disposable aluminum pan in hopes of using it like our cast iron pan. We threw in a few pounds of clams, sausage, some artichokes, potatoes, and a little white wine to boot. Yum, right? Well up until we where busy making a sandcastle. Somehow the bon fire was blazing higher under the pan than it should have and caused the bottom of the pan to melt a very large whole in the bottom of the pan. We lost about 90 percent of dinner that night to the hole in the pan. What was let was rather gritty from the blowing wind. So needless to say we threw in the flag and ate some leftover Pasta Salad I had made to bring with us. 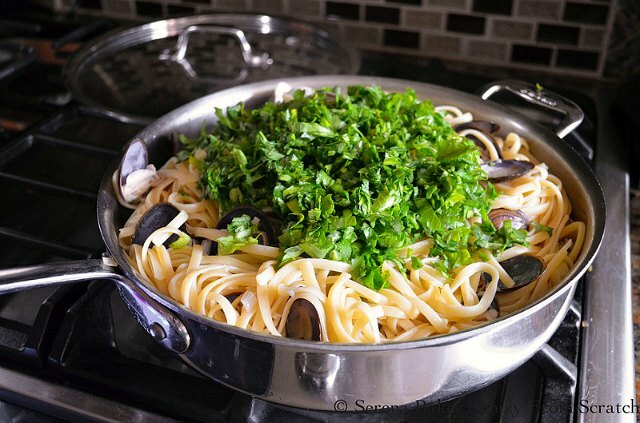 The kids really wanted to revisit the clam bake idea when they saw the clams but on this particular day pasta was a much more comforting idea. When buying clams ask the person sorting to check and make sure each one closes. Then after weighing to place on ice. This will help guarantee fresh clams on the ride home on a hot day. Once home make sure to open the bag immediately before placing clams in the fridge. I was told this by the person working the seafood counter many years ago. In a large bowl of Water add 1 tablespoon Sea Salt, and stir until dissolved. Add 2 pounds Live Clams, and allow to sit for a few hours. 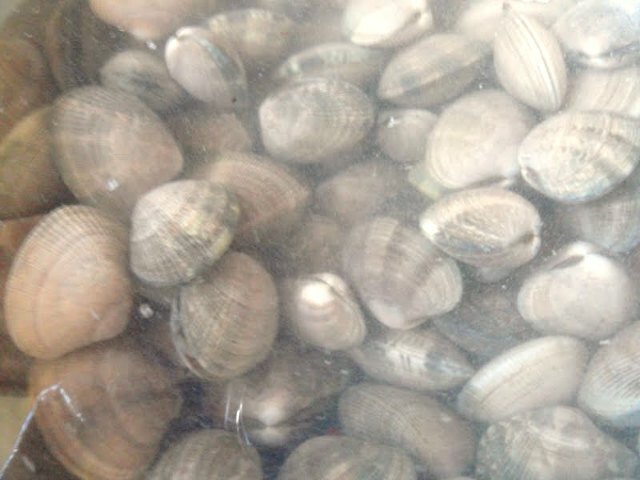 The clams will release most of the silt and sand in the clams helping to eliminate the gritty taste. 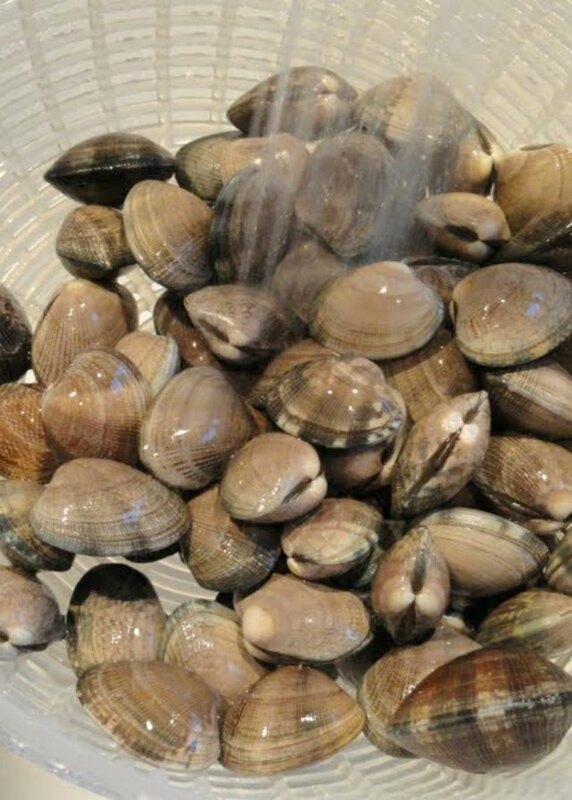 Rinse the clams well under cold water, sort through and discard any clams that are open. When squeezed shut they won't remain closed. Pour yourself a nice glass of wine, take a sip and get ready to begin. 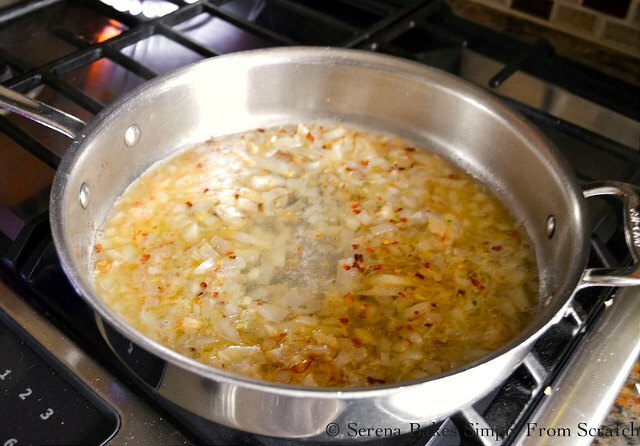 Melt 3 tablespoons Butter and 1 tablespoon Olive Oil in large pot or large deep sauté pan. 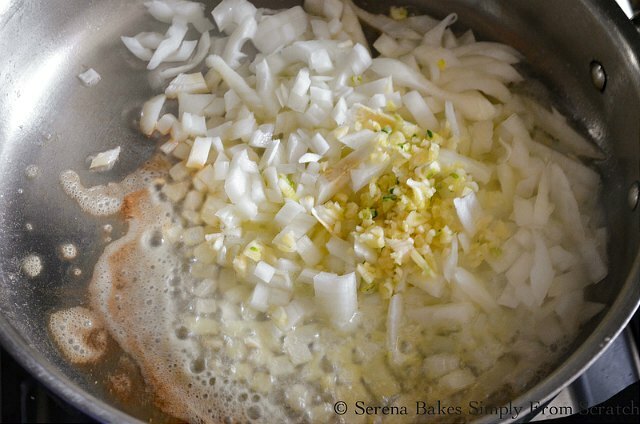 Add 1/2 a whole chopped Large Onion. Stir while cooking over medium-high heat until the onion is caramelized. Add 4 cloves Minced Garlic and a pinch of Red Pepper Flakes. Feel free to add more or less dependent on your taste. Add your 1 cup white wine and cooking over medium high for about 2 minutes until reduced. Add the clams, and 1/4 teaspoon Salt or to taste. Stir to distribute the onions, garlic and wine. Add the pasta and 2 cups of the Pasta Water. Toss to distribute. Cover pan and cook about 3 to 4 minutes until all the clams have opened. If a clam is left unopened discard and do not eat. Add a handful of fresh chopped Parsley and juice of 1 whole Lemon. 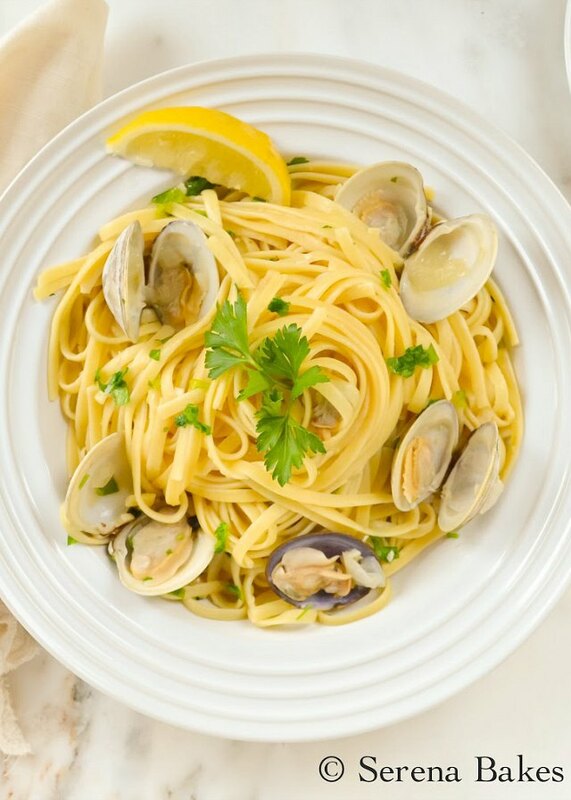 Clams with Linguine Sauce in a white wine butter sauce recipe is a favorite for dinner. It's elegant yet easy to make from Serena Bakes Simply From Scratch. Take a large bowl and fill with cold water, add the 1 tablespoon sea salt and stir to dissolve. 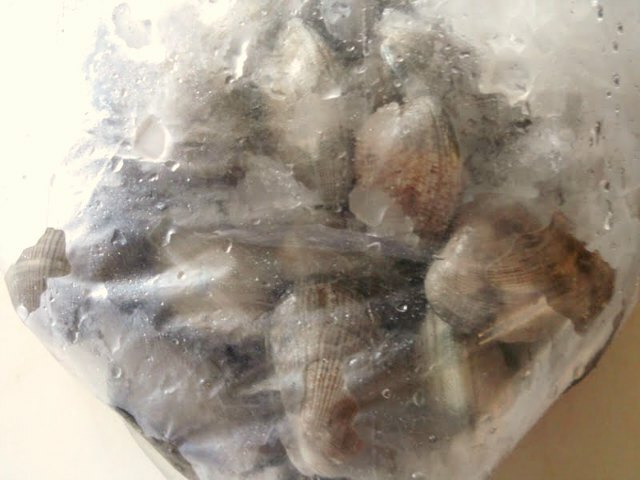 Add clams and allow to sit in the refrigerator for a few hours so the clams will release the silt and sand. Rinse clams and press any open clams closed, if a clam won't stay closed discard. Fill a large pot with water and bring to boil. Salt water well. Cook pasta in water until 1 minute short of al dente. Reserve 3 cups cooked pasta water for sauce. In a large pan add butter. Heat over medium high heat until melted and add onion. 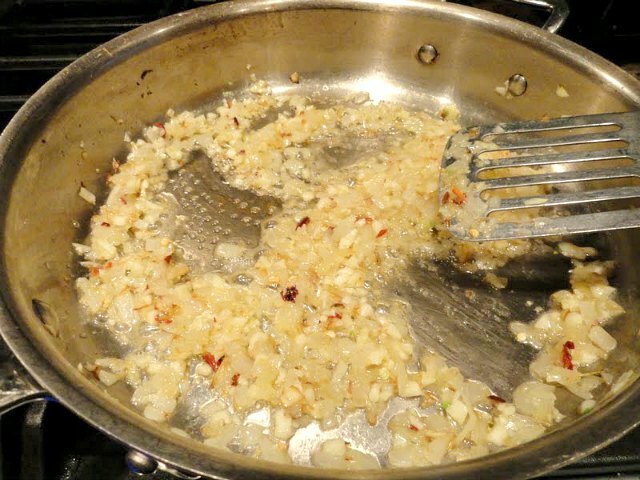 Sauté until onion is caramelized. Add garlic and red pepper flakes cook about 2 minutes until garlic is fragrant. Add white wine and reduce about 2 minutes. Add 1/4 teaspoon salt and clams, toss to coat. Add pasta and 2 cups reserved pasta water. Cover and cook about 3 to 4 minutes until all the clams have opened, any unopened clams need to be discarded. If the pasta has absorbed to much water add more pasta water as needed, to moisten the pasta and make a nice creamy sauce. Add parsley and lemon juice, toss to serve. Garnish with lemon slices and parmesan cheese. This meal looks delicious and is exactly what I order if its on the menu and I'm eating out :) yum! 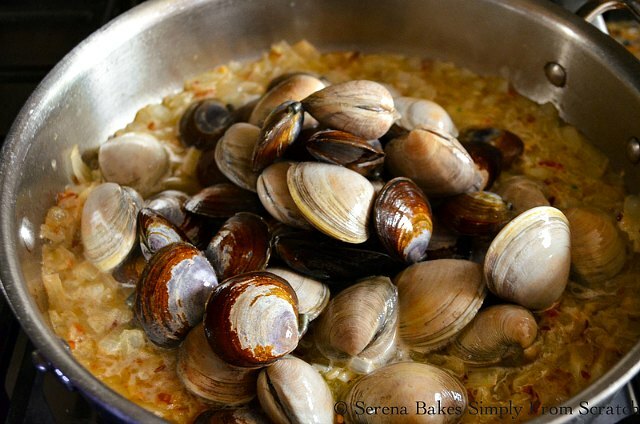 Yum, love clams... Looks amazing! Delicious linquine with clams and love the white wine sauce . Yes it is yumm,I can see it from 2nd last picture. How many will this feed ? You make your clams in white wine sauce almost identical to how I make mine! Sometimes I add a touch of cream, though. Now I'm hungry.